Recreation CenterThe Rec Center features a rock-climbing wall, a workout room outfitted with 80 weight training and fitness machines, and a field house with a 200-meter indoor track. It also houses a long-jump pit, putting green, batting cages, aerobics and dance studios, and more. The Employee Wellness Team gives its first Shout OUT to….. The Summer Academic Programs Staff (Matt Klooster, Amanda Williams, Joel Baumann, Beth Vivant, Erin Arntson) for taking their employee wellness to the Arb. 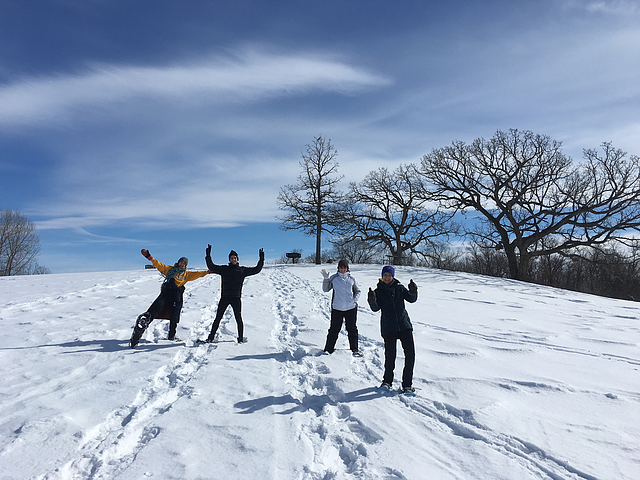 On Feb. 28th their team checked out snowshoes and on March 6th they checked out skis and ventured off trail in the Arb over the noon hour. No stories of any wipe outs or face plants that we know of! The Employee Wellness Team is inviting you to share your department’s wellness activities. We challenge departments to check out snow shoes or skis before the snow melts (we promise it will). You can share your stories with any member of the Wellness Team and we will highlight them as we receive them. Wellness Team Mission: In support of the College's mission, the Wellness Team takes an active role in promoting all employees' pursuit of a healthy balance of mind, body and spirit. We do this by publicizing and endorsing wellness opportunities, and advocating for health supporting environments.